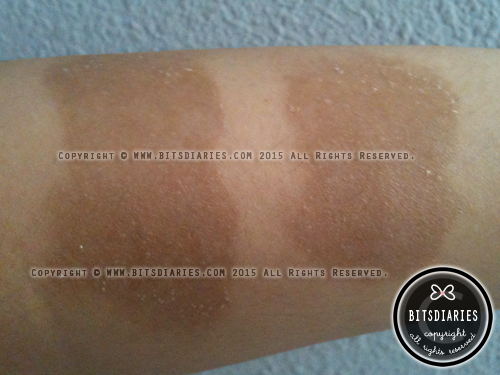 Skin irritation is a condition in which skin is prone to irritation when it comes in contact with irritants (e.g. harsh chemicals). It can also react to environmental factors like dust, pollution etc.. 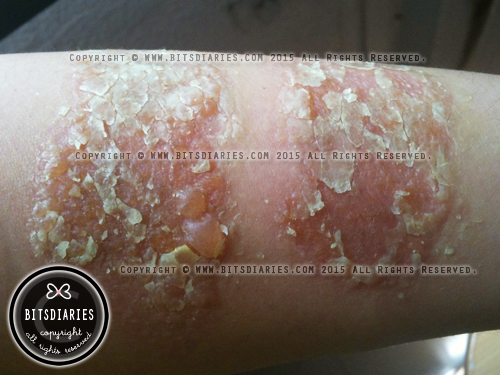 The symptoms of skin irritation include red, itchy, bumpy, rashes, burning and stinging. It can last at least a couple of minutes, and up to a week, depending on the severity. Sometimes, the rash comes and goes; most of the times, it subsides by itself with no physical pain and require no medical treatment. Symptoms: Itchy, red and bumpy rashes. - Discontinue the use of product that is causing the irritation, and avoid or temporarily stop using products that contain strong ingredients (if any; e.g. acne products) on the affected area. - DO NOT scratch the affected area. - Consult a dermatologist or doctor immediately if your condition has lasted for days, and is severe, and/or getting worse! - Use gentle products that are designed for sensitive skin and clinically proven hypoallergenic. Pick a good moisturizer because it will help to hydrate, soothe and calm the affected area, as well as speed up the healing process. "Skin Allergy / Allergic Reaction"
Skin allergy is a condition in which skin is prone to irritation when it ONLY comes in contact with specific substances (e.g. allergens). The symptoms of allergic reaction include red, itchy, bumpy, rashes, blisters (vesicles), scaly skin and groups of small pus-filled bumps. It can last about ten days, and up to three weeks or even longer, depending on the severity. And it may leave some scars. 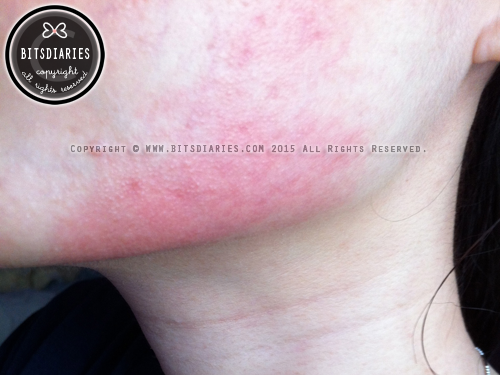 This allergic reaction was caused by Tea Tree Oil. 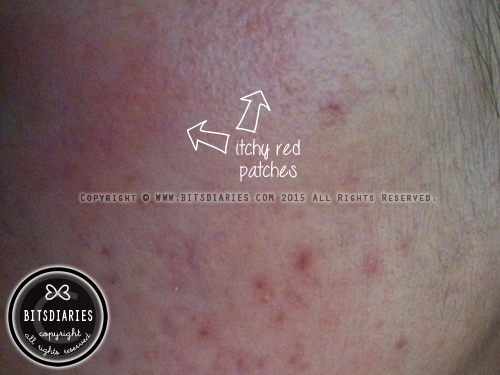 Symptoms: Itchy, red and bumpy rashes, with pus-filled bumps in groups. 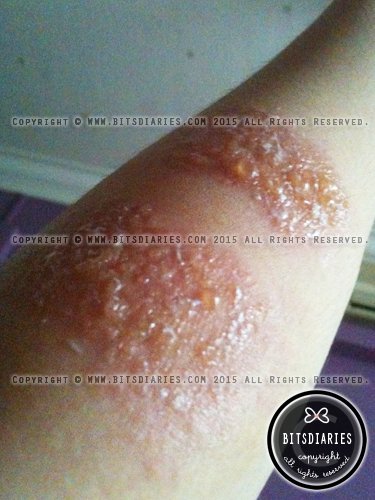 Symptoms: Itchy, red, raw, bumpy skin and infested with fluid-filled blisters (vesicles). Initially, they were just red bumps that itched. Soon it developed into blisters (vesicles) and grew bigger each day, so I sought medical treatment. 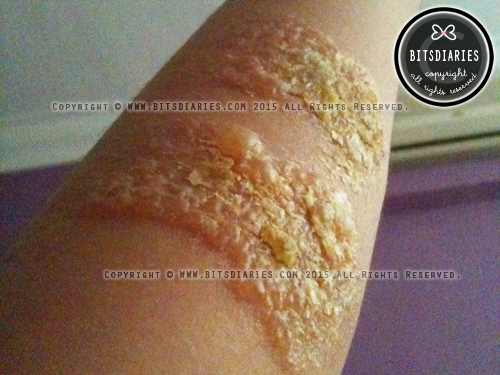 Blisters popped by a TCM doctor using seven-star hammer. During the popping process, it hurt. It felt like being bitten by a bunch of red ants. It took three weeks to get flattened out and healed; and it leave hyper-pigmentation scars, which took moooooonths to get completely and flawlessly healed. - Discontinue the use of product that is causing the allergic reaction, and avoid or temporarily stop using products that contain strong ingredients (if any; e.g. 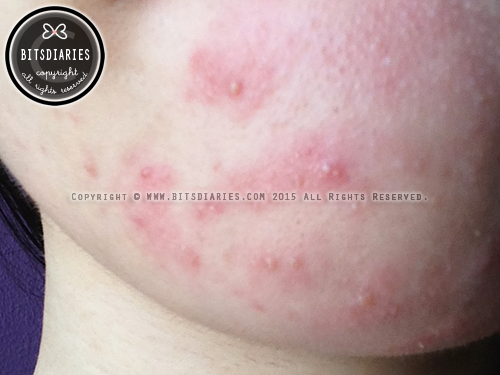 acne products) on the affected area. - DO NOT scratch the affected area! - If your condition covers a large area and develop blisters; lasted for days and is getting worse, I suggest that you consult a dermatologist or doctor immediately! - Same as the treatment for skin irritation... Use gentle products that are designed for sensitive skin and clinically proven hypoallergenic. Pick a good moisturizer because it will help to hydrate, soothe and calm the affected area, as well as speed up the healing process. *The suggested treatment for both irritation and allergy (mild cases) is what I usually would use to treat my own skin reactions, and it works well for me. 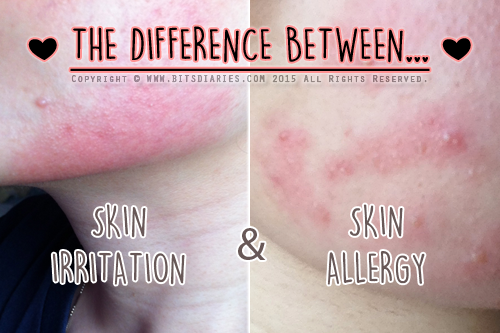 I hope this helps you understand the difference between a skin irritation and a skin allergy. Oh man! I truly sympathize. I recently had an allergic reaction to a serum I was using (the milder reaction; not the blisters) and I thought I could tame it by using a treatment from the same brand, but it turns out I was allergic to one of the ingredients the brand uses, and so my skin became much worse. I stopped using any harsh products on my face and bought a tube of Kiehl's Centella Recovery Skin Salve, which really helped to bring down the patch of bumpy rash on my face. After a week of using the salve, my skin is almost all better. It's cool that you're sharing your experiences and advice!